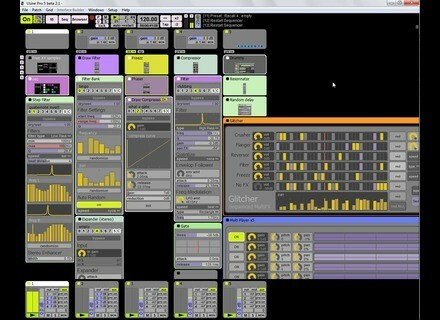 Usine 5, Modular sequencer from Sensomusic. Sensomusic has updated Usine to v5.25f. The main 5.25 update is described as probably the most important update since the v5.0 release so those changes are listed below first. It contains important improvements. Zero crossing is active now in the sampler during the recording process, if the option is activated. Better audio quality and synchro in the Grain Generator module. New on/off parameter in the send bus module. MIDI-learn is now allowed on all the buttons of the navigation bar in IB mode. Better size adjustment when moving/resizing controls. New protect mode as hidden string. Better Audio to MIDI (pitch tracker) sub-patch. New Active Line Number module, to get the selected line in the grid. New navigation bar design (IB mode). New MIDI Expand voices MIDI Tool script. New Math/Bit Operators OR, AND, XOR, NOT, SHL, SHR available as scripts. New improved Random Law Generator sub-patch. New options in the global IB "maximize if ON (Grid & IB)" and "maximize if ON (IB only)". Usine graphic engine is globally twice faster. Audio protection in the Filter module to prevent instability. New target parameter in the mouse module. New SET_LAYOUT instruction in the IML. In the Sequenced Pianoroll, we can now scroll the cursor position. Array's input in the XPpad module. The internal help form has a Minimize button. Set array parameter in the random module. Inverse Y axis option in the layout of XYPad. Array's input in the Draw Objects module. Up to 128 objects in the Draw Objects module. New layout option to draw connections between objects in the Draw Objects module. Parameter type ptPointerBitMap, ptPointer, ptLed added in scripts. Array's parameters are saved automatically in scripts except if SetDontNeedSave is called. New 1-X and X+1 math modules. New window parameter in the grain sampler module. The Delay module sounds better. New Compile&Init and Compile&Reload menus for scripts. Few new IML instructions: PAUSE, CREATE_UID, GET_CAPTION. DrawTrajectory user module has been updated (thanks to Martin Fleurent). 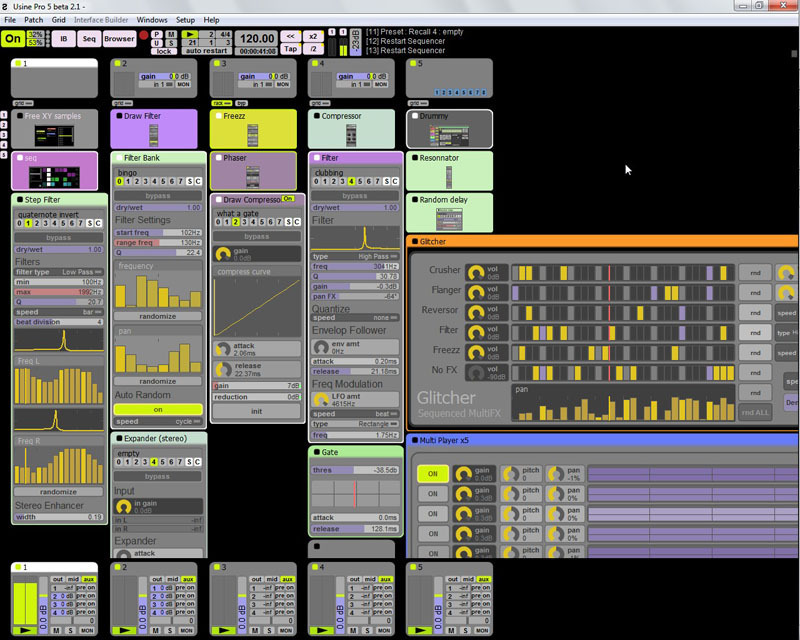 The Drag & Drop doesn't work in the sequencer. Various Drag & Drop issues in grid mode. Several important bugs in the VST Randomizor script. Hard bug when updating VST parameter's list. The SetVariableString doesn't work properly in scripts. Various bugs in the random data module. Various glitches issues in the VST version. Problems storing MIDI-learn's after copy/past of a sub-patch. Problems with negative numbers in the RandomData module. Various graphic refresh problems when the ASIO driver is down. Small refresh issue in the preset panel on recall. Sometime MIDI/Key learns aren't properly stored in the patch. The MIDI Sequencer duplicates MIDI Events in bar mode. Various conductor issues with copy/past bank. Refresh problem when a VST window is reduced as a thumbnail. The scale parameter of Faders/Knobs is no longer in the layout settings but is now in the module settings (as it use to be in the V4). The color selector is now opened with a double click instead of single click. MIDI/key learns can be lost from previous Usine versions. General: [usine] direct add-ons download reintroduced for gold members. Fixed bugs: [conductor] hard memory crash can occur on Paste Bank command. [sequencer] sometime the first notes of a MIDI file are not played definitively solved. [VST version] "no SPlib dll feature was found in the waterfall procedure" during scanning of VST folder. [global Synchro] sometime the first notes of a sequence are not played when the Auto Restart option is enabled. [conductor] sometime the last line can't be recalled. [conductor] the paste bank command doesn't work. [sequencer] the SendAllNotesOff sent at the beginning of a patch can cause troubles. [sequencer] sometime the first notes of a MIDI file are not played. [VST version] bad sample rate initialization. Fixed bug: Color inversion in the RGB Color user module. New tab in the browser to get a direct access to add-ons. New caption in master insert patches. More templates, especially in an empty area. New 'params' inlet/outlet in the VST module to get/set all the VST at once, with array's. 'Open selector' in the color selector module to open the color window. New 'target' parameter in the preset module. New 'target' parameter in the send mouse message. New help system: if the favourite language page doesn't exist, the English one is displayed by default. New find files strategy in LoadPatch and LoadWorkspace modules. MIDI learn is now enabled for all controls whatever their location. Extended VST parameter's concept to retrieve the param's real displayed value. ON/OFF values in the Toggle module. Refresh problem in the array module. Refresh problem in the piano roll after a preset recall. Hard VST bug when on initialization the BLOC size is not equal to 128. Draw Panel module is always repainted. Repeated scans in the browser can freeze Usine. INPUT_QUERY in scripts can freeze Usine. Roger Linn Design AdrenaLinn Sync 2 Updates Roger Linn Design recently updated the Mac version of AdrenaLinn Sync to version 2.0.3 and also released several beta versions for Windows - Beta 6 is the latest. SKnote HandSynth App SKnote has announced a new synthesizer for iPod/iPhone/iPad: HandSynth. RME Audio Fireface UFX This is not official yet but RME is about to introduce the Fireface UFX as the new RME audio interface, with 60 channels of audio.